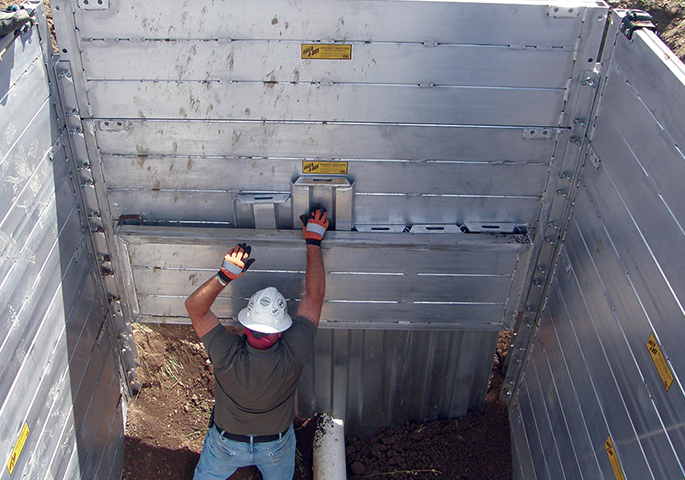 Compatible with XLAP aluminum shields is Efficiency Production’s modular aluminum trench shielding system, Build-A-Box. Build-A-Box component panels, corner posts, and accessories can be transported in a pick-up truck, and easily assembled by hand into two, three, or 4-sided shielding configurations. More complex configurations of Build-A-Box can be designed for special use projects. Build-A-Box also works in perfect tandem with XLAP; quickly adding height to the aluminum shield, or enclosing one or both ends of the shield. Build-A-Box’s flexibility makes it an essential tool for small utility and cable projects, municipal maintenance or on-the-spot troubleshooting applications. Exclusive corner end posts (same post for two, three, and four-sided configurations).